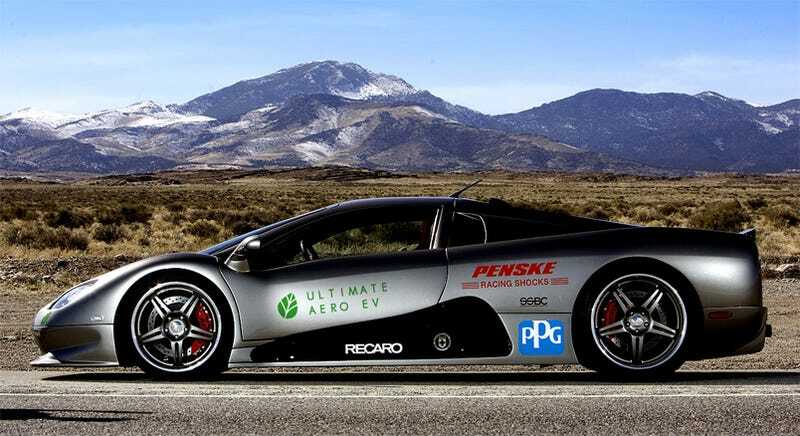 Shelby SuperCars already has the world's fastest production car title belt, now they're planning to up the ante, introducing the Ultimate Aero EV: The world's fastest electric production car, with a ten minute charge time. Not only is SSC claiming that they're creating the world's fastest electric production car, but they're also claiming that it'll be one of the fastest charging electric cars in the world. Their Nanotechnology Rechargeable Lithium-Ion Battery pack is said to take only 10 minutes for a full recharge on a standard 110 volt outlet and will grant the driver a total of 200 miles on a single quick charge. Watch out Volt, Tesla and Fisker. While the super fast charging time sounds great, it's the electric motor system that piques our interest. SSC has dubbed it the AESP, or All-Electric Scalable Powertrain, and what makes it unique is its scalable horsepower rating and liquid cooling in a single light-weight, compact package. The AESP is being developed to fit a wide assortment of applications from a 200 HP mid-size car; a 500 HP light truck or SUV and up to 1,200 HP with a "piggy back" setup for heavier duty trucks, buses and military equipment. Shelby SuperCars (SSC) released the details today of the revolutionary electric vehicle technology to be unveiled in the second quarter of this year. SSC will reveal its innovative all-electric powertrain in the current Ultimate Aero, the Guinness Certified "Fastest Production Car in the World," to create the Ultimate Aero EV and will reinforce the company as a benchmark in the auto industry. But unlike other auto manufacturers, SSC's new technology will set a new standard in the electric car industry – one of 10 minute recharges, super horsepower and ranges of up to 200 miles per charge. While other auto manufacturers focus on producing Green technology for specific cars, SSC's focus is on producing Green technologies for a wide range of applications for an even wider range of vehicles. SSC's electric powertrain package, named AESP (All-Electric Scalable Powertrain) is unique due to its scalable horsepower, light weight, compact size, quick recharge time and liquid cooling. SSC's Nanotechnology Rechargeable Lithium Battery pack is rechargeable in only 10 minutes on a standard 110 outlet and has a 150-200 mile range on a single charge. This means that in a typical 8 hour day, the car using this technology could go 200 miles, charge for 10 minutes (the time it typically takes to fill up a tank of gas), then drive 200 more miles, charge for 10 minutes and continue on. Some other EV technologies necessitate an overnight charge creating a class of "commuter electric cars" and are not practical alternatives to gas combustion automobiles. The AESP's main feature is its scalability. The all-electric SUV or delivery truck is now a reality in the not-so-distant future. The AESP is scalable from 200 horsepower for economy and midsize cars, to 500 horsepower for light trucks and SUVs, and up to 1200 horsepower for delivery trucks, heavy duty equipment, buses and military vehicles. The revolutionary design proves electric-powered vehicles not only match, but also provide more linear power (electric motors have 100% torque at 0 RPM) and overall performance than internal combustion vehicles. • Extended performance. Internal cooling systems are built into the motors. • Compact size. 1/18 the space of a standard engine; significant increase in cargo room. • Scalable horsepower. From 200 horsepower (one motor) to 1200 horsepower (two motors "piggy backed"). • Quick recharges. Only 10 minutes on standard 110 outlet. SSC's next milestone will be the pursuit of the "World's Fastest Electric Car" with the Ultimate Aero EV later this year.